Figure 1: Retractor bulbi muscle exposed, lateral view. 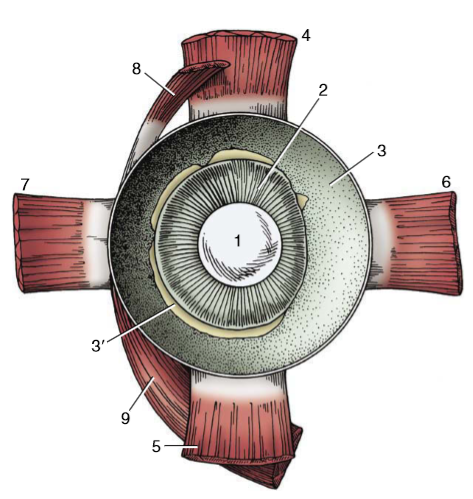 Figure 2: Extrinsic muscles of the left eyeball, dorsolateral view. Figure 3. 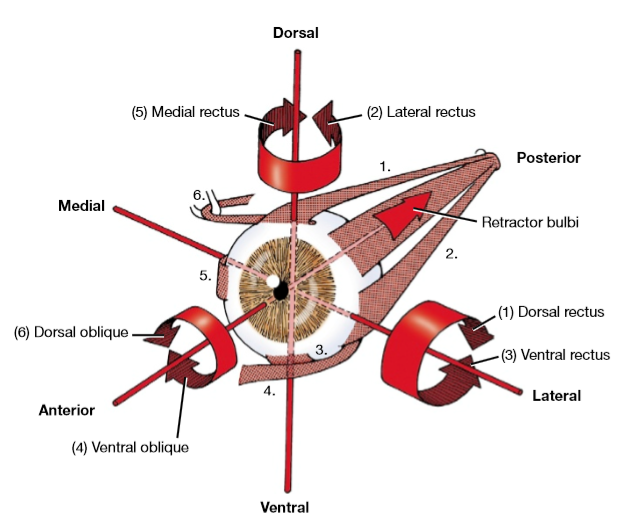 Extrinsic muscles of the eye, dorsolateral aspect. Source: Evans H.E., Lahunta A. (2012) Miller's anatomy of the dog, 4th edn., Missouri: Saunders Elsevier. Figure 4: Extrinsic ocular muscles and their action on the left eyeball. Figure 5: Anterior half of the left equine eye, viewed from behind. 1. Lens, 2. Ciliary body, 3. Choroid covered by pigmented outer layer of retina, 3'. 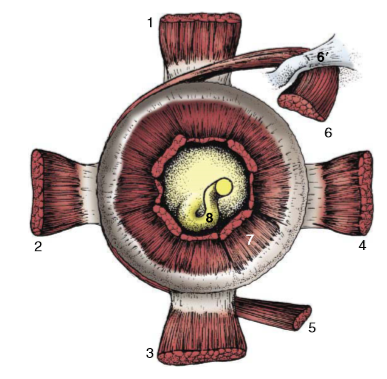 Remnants of inner nervous layer of retina which has been removed, 4-7. dorsal, ventral, medial and lateral rectus muscles, 8. dorsal oblique muscle, 9. ventral oblique muscle. Source: Dyce K.M., Sack W.O. and Wensing C.J.G. (2010) Textbook of veterinary anatomy, 4th edn., Missouri: Saunders Elsevier. Figure 6: Ocular muscles. 1. Dorsal oblique m., 2. Dorsal rectus m., 3. Retractor bulbi, 4. Medial rectus m., 5. Optic nerve, 6. Ventral rectus m., 7. 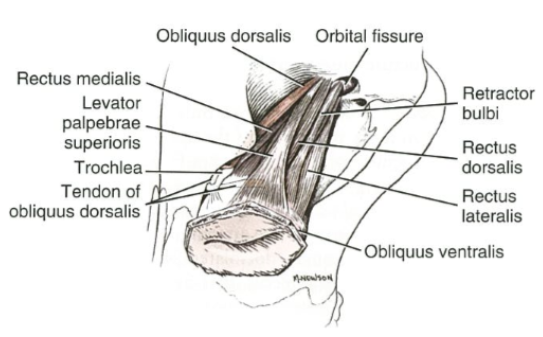 Ventral oblique m.
Figure 7: Stumps of ocular muscles viewed from behind the left eyeball. 1. Dorsal rectus m., 2. 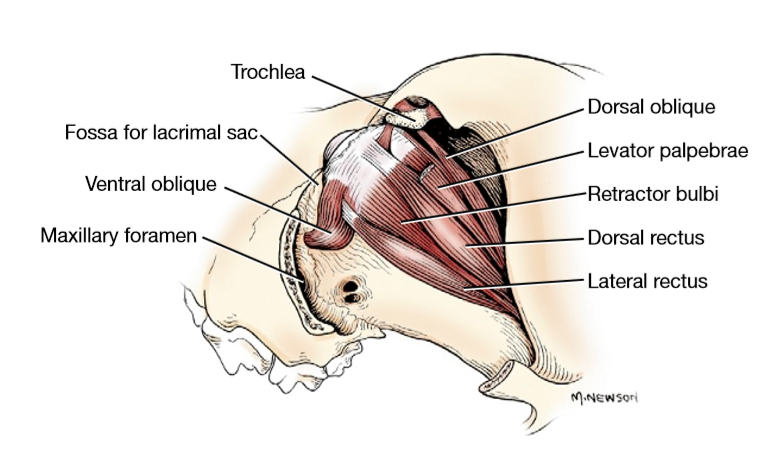 Lateral rectus m., 3. Ventral rectus m., 4. Medial rectus m., 5. Ventral oblique m., 6. Dorsal oblique m., 7. Retractor bulbi, 8. Optic nerve. 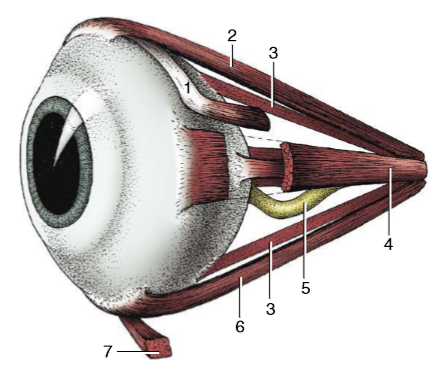 Table 1: Summary of external muscles of the eye with corresponding origin, insertion and action. Evans H.E., Lahunta A. (2012) Miller's anatomy of the dog, 4th edn., Missouri: Saunders Elsevier.